Alright, well, it’s been a while. It’s no secret that I sometimes take extended breaks. That doesn’t mean the collecting stops. Over the past few months I’ve had all manner of guests make a pit stop at Excavated Shellac headquarters to share sounds, from super-collectors to researchers to designers to dear friends. Amanda Petrusich’s book was released, in which I play a really small part, but was surprisingly quoted (almost at my most sarcastic – hey, I was on a roll) in the Wall Street Journal and LA Times. And I’ve also done a lot of work on projects that should see the light of day in the next year if I can swing it. My point is, sometimes it’s good for me to just take a break, take stock of why the hell I’m doing this, collect without that obsessive “need” and without impending, unwieldy projects looming overhead (real or imagined), and just listen to music for a while. I’d realized it’s been about five years since I’d posted music from China. This disc, recorded ca. mid- to late 1928, is an unusual example as it does not feature a type of Chinese opera or popular music, probably the most overwhelmingly common types of music recorded in China at the time. Instead, it’s a recording that features chanting from a Buddhist sutra – specifically from the Vimalakirti Sutra. In the sutra, a goddess visits the room of the layperson Vimalakirti and proceeds to scatter flowers over both enlightened bodhisattvas and disciples, all gathered in the room. The flowers immediately fall off the bodhisattvas, yet they stick to the disciples. The goddess explains (quoting one easily obtainable English translation): “It is only because the latent influences [of your afflictions] are not yet exhausted that the flowers stick to your bodies. For those in whom the latent influences are exhausted, the flowers do not stick.” This seems to be the precise reference in the title to this piece, the “mantra” sung by three “householders” (laypersons, or “retired scholars” per Prof. Silk). The Victor Talking Machine Company was one of the most prominent companies recording in parts of China in the early part of the 20th century, although all major labels were quite active. Their first one-sided recordings of Chinese music, on their Monarch label, were made ca. 1902, likely in San Francisco, and are quite rare and in demand. They eventually began recording onsite in China in 1905. In the meantime, they continued their trading arrangement with their “sister” company in Great Britain, the Gramophone Company, who had recorded in China before Victor, in 1903, by repressing some of those earliest recordings on their own Victor label. By the end of the first decade of the 20th century, Victor was recording Chinese music in all manner of dialects and styles including Amoy, Mandarin, Fuzhou, Shantou, Teochew, and especially Cantonese. 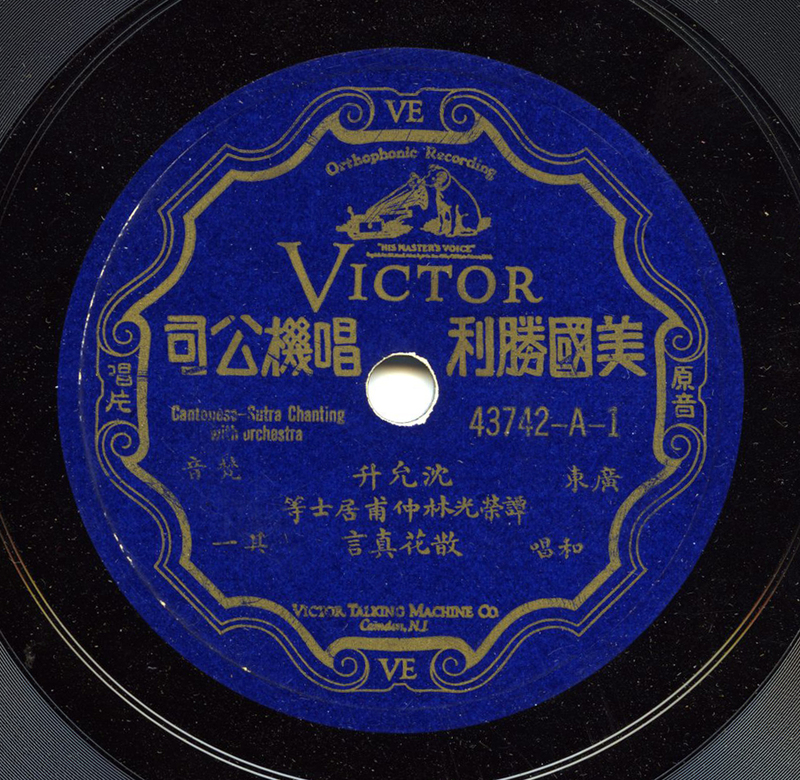 Victor recorded thousands of Chinese discs before World War II. I’ve broadly and extensively documented Victor’s activity in a paper that will soon be published online, which I will eventually provide a link to. I’ve included both sides of this record. For help with all our “latent influences.” Enjoy. Thank you to Sun and the research of Du Jun Min. Well worth the wait. Thank you as always. That is a great track. It’s reminiscent of some Native American music I’ve come across. And the percussion heavy outro right at the end part two is just mind-blowing! Many vintage Chinese records I’ve heard have a similar let’s-throw-all-the-metal-into-one-bin mentality towards the end of the record but, like here, they tend to still manage to keep it musical and tight. Glad you enjoyed! Yes, this has a totally different function and history compared to Chinese opera recordings (likely what you’ve heard, vintage-wise, judging by your descriptions…actually, I really love early Chinese opera). Extraordinary stuff – not like any other early Chinese recording I’ve heard. Thanks, as always, and here’s hoping we can look forward to more from Excavated Shellac before too long! Thanks for this and thanks for your wonderful site. I love so many of the areas you pursue (Central Asian music, old Blues) and was delighted to see this recording that I can share on my site. I will add it for Jan 25th. Thanks again for all of the great musical sharings!